That's fine, but since F1 was released, it did nothing to dispel concern over DE:MD. And considering that Feral posts here, they can respond to posts where a user is excited about a game - where they then stoke that excitement - but when someone wants to know what's going on with the exorbitant giant delay, they get crickets. Having the gaming community speak for them doesn't help much. The FB post is 4 months old. I am concerned that the longer the delay, the less a business case Feral has for Deus Ex. I'm holding out. I want to support the company porting my favorite games to Mac - but it's kind of strange that there is not much info available nor any kind of community focused correspondence. Maybe they're waiting on Apple to solve a few remaining bugs. And as everything related to Apple, they can't communicate. As they've already released F1 2016 and Total War: Warhammer, it seems unlikely that there are still further issues with Metal preventing only Deus Ex: Mankind Divided (but not the other two) from being released. It's very possible that Feral simply didn't want to release three major titles at the same time, so are staggering release. Sometimes you do have to be patient, regarding games for the Mac. Feral will come out with the best port they can deliver, when they are ready. That's a very unsafe assumption. Each game has its particularities. 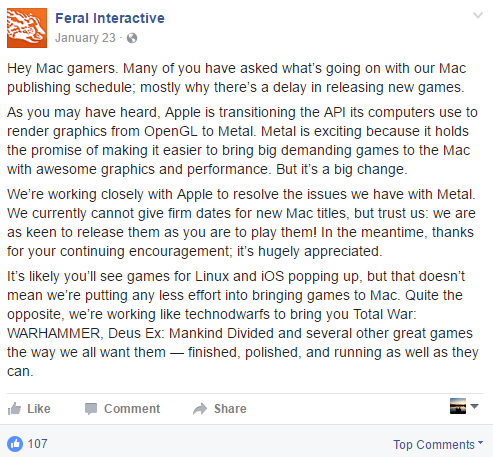 I can't find it anymore, but Feral had a more recent tweet in which they said DX needed a bit more time than Total War. It's coming. It's about as unsafe as assuming that game not out = Metal broken. Again, as I said before, it's also very possible that they simply didn't want to release three titles at the same time, so focused their efforts on F1 and Total War while putting the finishing touches on Deus Ex. "Metal + RX 480 couldn’t reach over 60 FPS at any point due to the lack of VSYNC OFF setting. In Windows, it was OFF. Meaning that Metal’s average 55 FPS on macOS is indeed superb result compared to DX11 (average 50,1/52,6 average FPS on Windows – RX 480/GTX 980)"
So F1 2016 running on metal in OS X is outperforming the DX11 version in Windows ? If true, that is fantastic news. It's currently $15 on Steam. Alright, just bought it. Feral do damn good ports and I'm not going to install this in Bootcamp. I hope I can run it tho. Too bad the DLCs aren't on sale: $24 for two quite short DLCs is a big rip off. I picked them up for about $6 each a few weeks ago during Square Enix's store sale. They'll probably hit that price again soon. Buy them separately instead of the Season Pass, as the extra items you get are pointless and just make the game easier. Has anyone heard an update about Mankind Divided? I mean this is just wrong. The company porting the games posts here to get us all excited about the announcement of a game we were told would be available a Auear Ago! And then silence? That's very disrespectful to the gamers that support them. There really should be an update if they care at all. I've held off for s freaking year of buying the game on console. Can we just have any indication as to wether the game is even coming? Anyway, SteamDB history entries shows, Feral is still working on Mankind Divided for macOS. Even though the early provisional system requirements have vanished from Feral's site. Who knows, maybe macOS 10.13 with Metal 2 is needed to get Feral where they wanna be with the port. In fairness, your decision to wait for an entire year when you could have played it on console anytime is your own choice. You have only yourself to blame there if the console option was worth mentioning as you did. Feral is a far better company than you are imagining now but the transition to a completely new API by Apple that impacts Feral is beyond their control. It's going to be a great thing over time but issues over how long it is taking, etc. really ought to be addressed at the source which would be Apple, not Feral. As for no news for a long time, what do you want them to tell you if there is no news to report? Have you called them? Have you written to them? If you want to know so badly why not? Their support people are really nice and would answer you to the best of their ability if you gave them a chance. A public forum they are nice enough to visit with news as they can is really not the place to demand answers, you know? Well, it isn't if you expect to get any I would say. Give them a chance with this stuff and I believe you will be pleasantly surprised when they are able to deliver the goods that I am very sure they want to as badly as you want them. They aren't miracle workers. Software development is incredibly complex and when you are at the mercy of other forces, like a huge API change by the company making the operating system which progresses at that company's discretion and capability, you just do the best you can and they are. For cases of horrible customer service I would refer you to Steam, EA, Ubisoft, etc. to name just a few. Those clowns richly deserve the ire of gamers. Feral does not. Probably they are waiting for Metal 2 in High Sierra. They could just say that. In the Feral thread, after Feral's enigmatic response, my hypothesis was that Square Enix is working on a $40-60 Complete Edition akin to the Director's Cut of Human Revolution, which Feral waited for.